I got this tee before fashion week and have been wearing over and over again. It’s long-sleeved but really light, making it the ultimate layering tool (I have the shirt in stripes too). The tie-dye print is a little off the beaten path for me, but I love it. I’ve been pairing it with my new (and super cheap) faux leather jacket from TopShop. This gem is only $85. Game. Changer. Love how you mad tie dye look so chic. Great outfit. Love a mostly black look and love the way these earrings look with this outfit! Love your tee and that scarf combo is so fun! 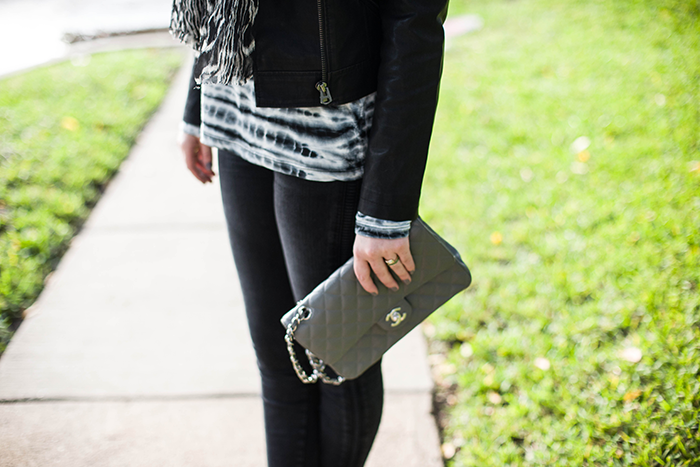 Fun combination in my favorite color palette – black, white and grey! I love how you combine such muted colors to something so fun!! Love love love the tie dye on you! Super cute. Total perfection and I LOVE those amazing earrings! I’m buying those earrings now, wow!!!! 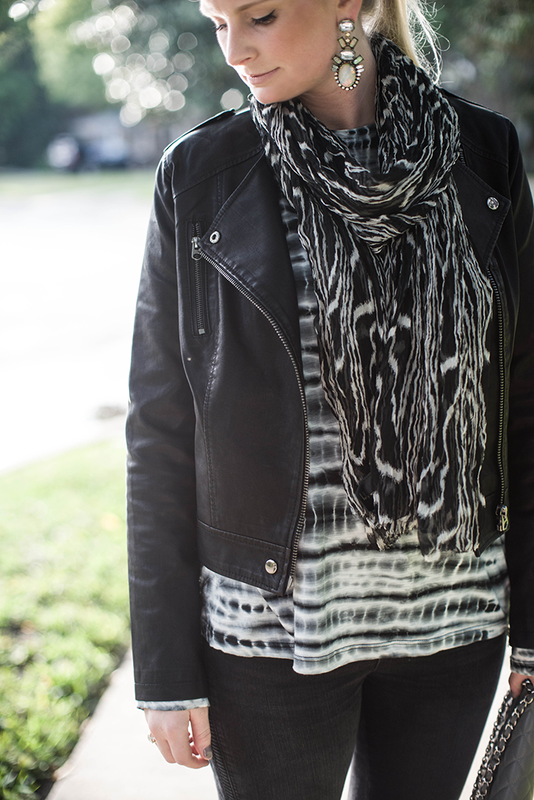 The tie dye paired with the wood print scarf is genius! Love this combo! Love how you mixed the scarf and tee together! stopppp. this is one of my favorite outfits of yours!!!! so pretty. those earrings and that blouse are GORG! Oh how I love the tie dye on you!! You’ve just created the ultimate outfit of black, whites and greys – tres chic! Hope you had a wonderful weekend! Love love the two prints topped off with a leather jacket and those fab earrings! Perfect! I would be wearing that t-shirt all day as well, its gorgeous. The tie-dye looks great and I love the all black look with it. I love the tie dyed tee. Cute outfit and very classy. OMG I Love this easy look! Love that tshirt (and I usually don’t love the tie dye look)! And the jacket is fab. You look amazing! the earrings are so good…and I love, love your top!! You look so beautiful. ANd its the perfect outfit to go out to dinner. Adore that leather jacket! Completes the look so well! 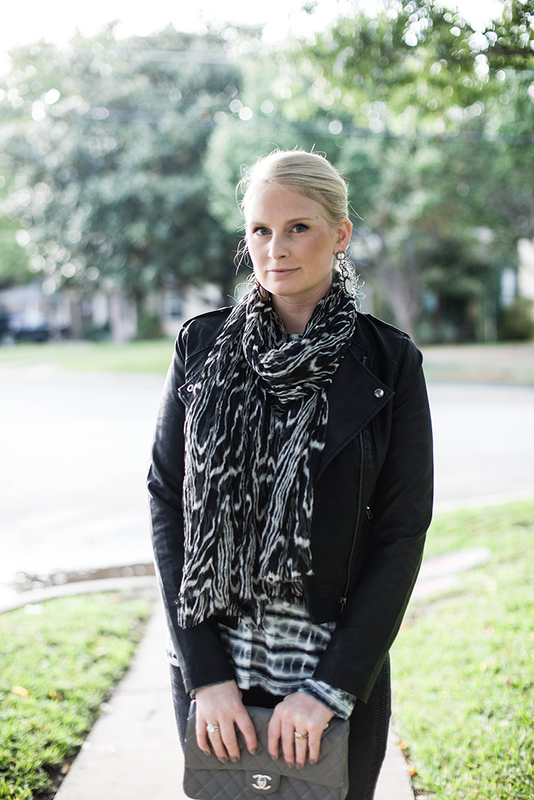 You’re right, the shirt is the perfect layering tool and those earrings are gorgeous! Love this outfit! I hate when I’m style stalking, and I find a piece I absolutely adore. Then, I click through to the link only to learn I absolutely deplore the price. Based on your pics, I was prepared for a similar experience with this jacket. What a pleasant surprise and a great find! Love how you toned down tie-day to make it wearable and chic. Great blog by the way! That BAG! The color is amazing.